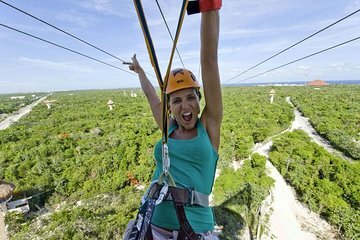 Make your way to Xplor Park, just outside of Playa del Carmen in the Riviera Maya. Your all-inclusive ticket will get you access to the park’s facilities throughout the day, as well as the chance to try all four of Xplor’s adventure options. Get behind the wheel of an amphibious vehicle to drive above and below-ground trails, then paddle a raft through an underground river. Head to the treetops to try a 14-line zipline, hitting speeds of up to 19 miles per hour (30 kph) on your way through the course, ending the circuit with a splash and a water landing. Keep swimming through a series of caves, grottos, and sinkholes, floating just beneath a cavern roof that’s bristling with stalactites. When you’re ready for a break, simply head to the onsite restaurant for a buffet lunch with unlimited smoothies and juice, the perfect fuel for an afternoon of active fun. Each activity takes roughly 45 minutes, so you’ll have plenty of time to enjoy the rest of the park (or just relax in a hammock) before the day concludes.